35 Winners for 35 Years! 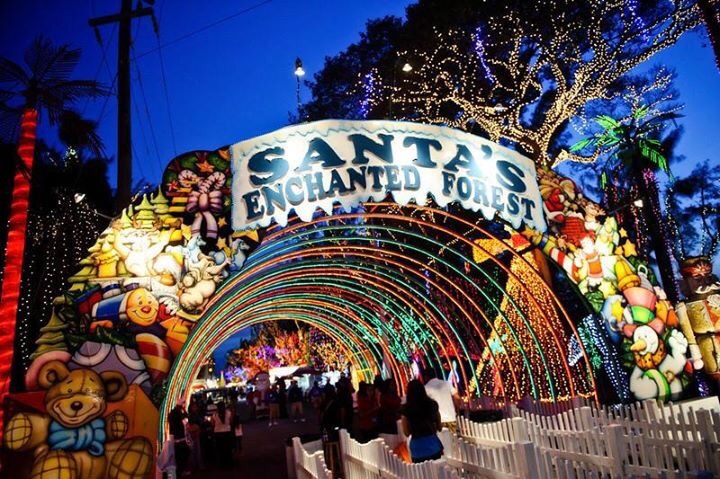 Santa’s Enchanted Forest is Now Open for its 35th Year! We plan to party all season long and look forward to sharing this celebration with you. For starters, let’s kick this anniversary off with a season of winners. Want to win a pair of tickets to the park? Now’s your chance. Click here to enter. We will choose five winners at random each week beginning Nov. 9 for seven weeks until we’ve named 35 winners. See what we did there – a winner for each year we’re celebrating! We’d also love to hear all of your memories from the past 35 years. We have so many enjoyable memories from seasons past, and we’ll share a few below. Tell us about your most memorable visit – whether it’s your first visit or if coming to the park has been a longstanding family tradition passed on from generation to generation. Comment on our blog or post on social media using the hashtag #SEF35. Santa’s has something for every age, but we delight in seeing the faces of kids experiencing the excitement for the first time. The smiles are priceless and timeless! The reactions to our rides never disappoint! Visitors show how much fun they are having in their expressions and we love it! And this year we’ve added new thrills with the Sky High Ferris Wheel and the Mega Drop. Check out all our rides and share your favorites with us. Meeting Santa. Santa on a jet ski. Santa on a boat. The Grinch on a jet ski. We’ve got cutouts, holiday displays and of course photo opportunities with our gorgeous tree and Santa himself. All of these pix warm our hearts. Tag us with your best snapshots! The costumes and laughter were always a great way to kick off the season. While we fondly share these pics from years past, please note that the dates for Halloween and Santa’s opening will once again align in 2019 and 2020 … it’s never too early to start planning for Halloween with Santa! We’ve had stories of engagements on Mistletoe Lane – the lights and gazebo are the perfect setting for this milestone. Do you have a tale to share? Your first date, anniversary celebration? Let us know! And if you are planning on having date night at Santa’s, try these activities to add a little fun competition to the evening. Be sure to tell us your favorite part! We love lighting up the South Florida skies every night. From the largest Christmas tree in the area to the literally millions of bulbs that decorate our space, we are so happy to extend the holiday spirit to everyone. We hope you’ve enjoyed the spectacular light shows we’ve shared over the years. It’s wonderful that we now get to see so many more of our visitor’s special moments, thanks to social media. We hope you’ll continue to share them with us for years to come! Don’t forget to enter for your chance to win tickets! There’s so much to see and do this 35th season at Santa’s Enchanted Forest! Santa’s Enchanted Forest, 7900 SW 40th St., Miami; Open 5pm – Midnight daily, from November 2, 2017 – January 7, 2018, including holidays. Santa’s Thanks Our First Responders! Santa’s Enchanted Forest couldn’t be prouder to be celebrating its 35th anniversary in South Florida. When the doors open on November 2, you can expect to experience the holiday spirit, joy and fun that have kept visitors smiling and laughing for the last 35 years. This anniversary, Santa’s wants to express its appreciation to its South Florida community and family for making Santa’s a success year after year. We also want to take the opportunity to say a sincere thank you to all the first responders – firemen, police officers and paramedics – who not only jump to service during a crisis, but are also on site at Santa’s every season in the event of emergencies. To further show our gratitude, South Florida’s first responders and their guests* are invited to enjoy Santa’s Opening night festivities! * Santa’s will kick off the 2017 season with it’s annual tree lighting ceremony and a special dedication in honor of all the heroic efforts made for public safety. Members of the Miami-Dade County Commission will also be present to express their appreciation. The celebration begins at 6:30pm. Join us November 2 as this exciting season gets under way! We hope to see you there. *Police, paramedics and firefighters are invited to enjoy Opening Night Festivities at Santa’s Enchanted Forest and will receive 50% OFF regular single day admission tickets (including up to three additional guests). First responders must show a valid and current government-issued ID and accompany their guests to the park. Offer valid for November 2, 2017 only. Santa’s loves its Season Pass holders. If you haven’t purchased your Early Elf Season Pass yet, here’s four reasons to do just that. 1. Unlimited fun. A one-day ticket to Santa’s Enchanted Forest includes all carnival rides, but with so much to do, you’ll want to experience many of those thrills again and again. A Season Pass gets you unlimited access to all that fun! 2. Flexibility. Bring the little kids for an hour or two. Let the teenagers hit the rides for all seven. With a season pass, you have the option to pop in just to enjoy the magic of the Christmas tree spectacular and satisfy your craving for carnival food or plan an outing for the entire evening. 3. Park Perks. Season pass holders who purchase their tickets online get special perks, including discount coupons to use inside the park and other exclusive offers throughout the season. We’ll send you deals for Black Friday, an invite to bring a friend at a discounted price and VIP express pass opportunities for a steal. 4. New Attractions. Santa’s is celebrating it 35th anniversary in a BIG way with spectacular NEW rides, games, shows and attractions. You won’t want to miss a chance to soar 155 feet high on the Largest Traveling Ferris Wheel in North America with views up to 15 miles away. And for those looking for extreme thrills, the Hard Rock and Roll makes its debut for the first time in Florida. Whoa! Families won’t be disappointed either with the addition of the Euroslide, Santas’ Snowstorm, an all new Christmas tree light show and 20 percent more kiddie rides. There’s more …. but you’ll need a season pass for sure to do it all. Convinced? Purchase your season passes online today! Buy your park passes online. You’ll be able to head directly into the park and won’t have to spend time waiting to purchase tickets at the gate. Click the “Buy Tickets” tab on Santa’s Facebook Fan Page or visit santasenchantedforest.com to get your passes today. Come early – gates open at 5:00 p.m. – and stay late – the park is open until midnight. Seven hours of fun await! Visit Santa’s on a week night. Saturday is without a doubt the busiest night at the park, and the lines are definitely longer on the weekends. If Saturday is best for you, consider buying an Express Pass to skip the lines and get on your favorite rides quickly. Pack a disposable poncho or rain jacket – we mostly love South Florida weather in the winter, but sometimes it does get wet. As you know, the rain doesn’t last long when it does blow through, so being prepared means you won’t have to cut your trip short if the weather isn’t ideal. To beat the crowds, walk straight to the back of the park and then work your way to the front. On your way to the carnival rides, look at the schedules posted in front of the performance areas for each of our nine nightly show stages. Planning the best time to take in the amazing entertainment is a great way to get everyone in your group to meet up and watch a show together. Leave some time to indulge in our delicious food and beverage options. Grab dinner or a snack to enjoy while watching a show. Try your luck at a carnival game. Prizes make great gifts for kids of all ages! Look out for the specially designed Santa’s Enchanted Forest photo stops. Make a special memory and take a family photo. Take your picture with Santa. Head to his workshop early in the evening and then pick up the photos on your way out. Leave your mark on Santa’s by embracing the kid inside. Look for Santa’s coloring board and add your artwork to the mix. Buy a souvenir to help you recall the great memories all year round! From photos to knickknacks, there are lots of options to remember your special evening at the park. With this plan in hand, you’re all set for magical evening at Santa’s Enchanted Forest! Santa’s Enchanted Forest, 7900 SW 40th St., Miami; Open 5pm – Midnight daily, from November 3, 2016 – January 8, 2017, including holidays. The most enchanted holiday spot in South Florida is on its way back for it’s 34th season. If you’re from South Florida, you grew up with Santa’s Enchanted Forest. You also know it’s not just for kids. Behind the highway view of lighted holiday trees, lies this magical world …Open from November 3 through January 8. Here’s an inside quick look at what awaits you…. Just past the entrance, through the blinking archway, you’ll be captivated by millions of colorful, twinkling lights, unique holiday displays and a 90 foot musical Christmas tree light show.